This past week, I was lucky enough to take care of a patient who is 100-years-old. She was admitted to the hospital for a lung infection and as each day passed, she would tell me stories of her youth. Her colorful stories would paint beautiful narratives of the days she would go dancing with her beaus (her dance card was always full, of course) and sneak away to the movies in silk stockings with her girlfriends. She recounted the love stories of her many ex-husbands, and we would giggle together about her great grandchildren between her fits of coughing. I would hold her hand as I sat at her bedside, and grin at her as she recounted the remarkable memories of her 100-year life. When I came to see her in the afternoons, I would immediately pull up a chair and take hold of her hand. She would stroke my fingers with her thumb and squeeze my hand when she got to the highlights of her stories. I loved holding her hand. Another patient, in the room across from her was a very sweet, and very sick, elderly gentleman… he was so weak that sometimes all he would respond to was the squeeze of my hand. No matter how tired he was, he would always squeeze my hand back. In our busy, modern lives, where we mostly communicate by text, email, and social media, we think we are connecting, but we continue to separate ourselves with black and white letters and bright, faceless screens. We forget how important a tender touch can be. How our basic instincts to feel a sense of belonging and nurturing can be fulfilled with just a gentle, caring, human touch. 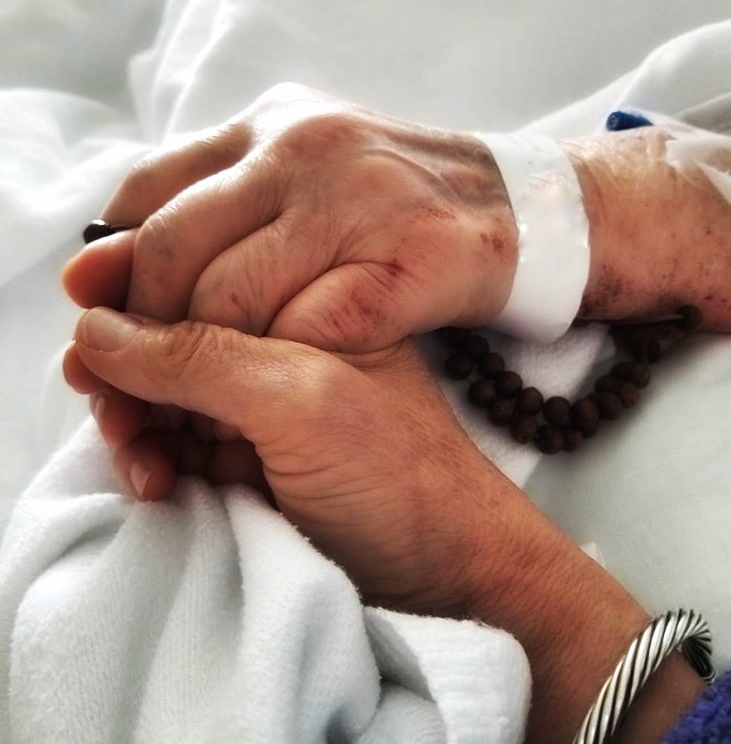 The one thread that I have found in all my very ill and elderly patients, who are, at times, literally on their death beds, is how much they crave a tender touch, a connected hand hold.